Sarah Pennington traveled back through time to save the ancient Kingdom of Aeronheart, but at the cost of losing her time machine, The Royal Griffin, and her only way back home. Or is there another way? Sarah comes up with a clever plan, but the ruthless Dragon Clan always stays one step ahead. They will stop at nothing to make sure Sarah stays buried in the past forever. Join Sarah as she journeys to a land beyond time in search of a way back to the future. 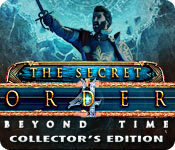 If you like The Secret Order: Beyond Time Collector's Edition game, click to start The Secret Order: Beyond Time Collector's Edition download. Sign-up to get informed when the The Secret Order series has new game released with BD Studio Games' FREE bi-weekly newsletter.